Submitted by steev on 3. 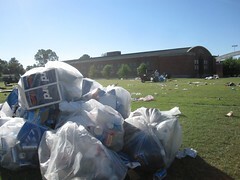 October 2010 - 15:19.
the trash left behind on U of Arizona campus next morning after a football game. of course the workers had already bagged everything by the time i got there and were making it disappear.